Phew! First post back in way too long. I’ve been working on commissions, had a major home renovation and took a trip to California, which I’ll be posting about soon. I’m happy to call this piece finished. I must say, I’m happy with the final result and it will be hanging in my home until it finds a new one. 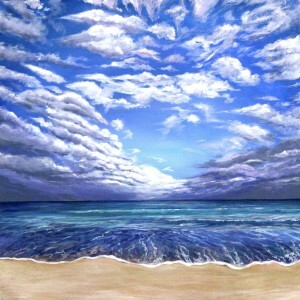 This piece was inspired by two things: the sky and the Atlantic Ocean. The sky and clouds are stunning natural wonders. The world’s climate is fed by water, including the oceans around the world, which creates an ever evolving view of the sky. Weather forecasts are predicted by hundreds of years of data about participation and clouds. Did you know the Atlantic Ocean, the second largest ocean (21% of the Earth’s surface) is named after Atlas of Greek mythology, Atlas was known as the titan of astronomy and navigation.